Built upon the first Inter-American Summit on Conflict Resolution Education sponsored by the United Nations Development Program (UNDP) and the Organization of American States (OAS) in March 2007, the goals of the 2009 Summit were policy implementation and sustainability. This was accomplished by bringing together international and national stakeholders to exchange successful examples of macro level policy design and implementation models. While separate fields, each share a common goal of providing a foundation for the learning and growth of students. Is a term often used interchangeably with civics education, both forms of education focus on preparing students to be effective and productive citizens of their countries. Skills of citizenship education: living together in peace, democratic participation, and living with plurality and diversity. This form of learning focuses on personal and interpersonal skills needed to navigate our relationships in an effective manner. Skills included in this field: identifying and managing our emotions, developing concern for others, resolving conflicts and making ethical decisions. Conflict resolution education is a form of education focused on teaching tools and processes to productively address various conflict situations. Relevant skills include emotion identification, verbal and non-verbal communication and problem solving. This form of education is both a philosophy and a process that challenges and aims to hinder forms of violence in society. In peace education students learn the root causes of violence in society and also learn powerful alternatives to violence. Peace education skills include listening, reflection, and problem-solving. This event brought together government representatives from among the 50 states and invited countries (Ghana, Kenya, Montenegro, Philippines) and their non-governmental organization partners. 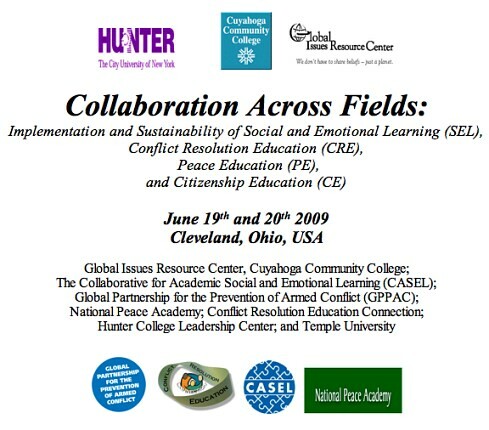 Organizations participating were invited because of their interest in developing legislation and policy in peace education, social and emotional learning, conflict resolution education, and/or civics education and their interest in securing ways to strengthen implementation and achieve sustainability of these efforts. All 25 attendees were given an opportunity to collaborate with colleagues with expert knowledge of their fields and efforts in their states or nations. The summit provided the attendees the opportunity to learn from content experts in their respective fields and to gain insight to better inform their own work and models. This Summit provided all of these experts a forum to network, identify challenges, brainstorm solutions, and build a network of like minds working toward the same goal: providing generations to come with a complete foundation for success in academic learning and life-long success.